Did you mention oranges? Oranges are not low-carb! True – they are not. However, we are only going to be using a small amount – zest of one orange, which adds zero carbs, plus 2 tbsp (roughly 1oz / 30ml) freshly squeezed juice (yield from about 1/4 medium orange), which adds 3g net carbs to the recipe. This means it will only amount to less than 0.5g net carbs per serving, which I think is acceptable, considering its important role in enhancing the flavour. And you can always feed the rest of the orange to a non-low-carbing friend! If you feel zero-tolerance about oranges, I suppose you could substitute orange juice for some orange flavour extract, but I would recommend the natural option, even if it does come with a small bit of carbs. Streusel is a crumbly topping sometimes added to breads and cakes. 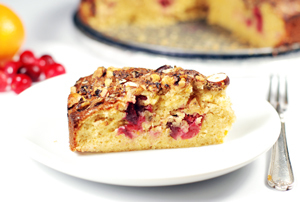 Chopped nuts with a bit of sweetener work really well in this capacity, so low-carb cake recipes often come with nut streusel. Shall I use fresh or frozen cranberries? Either would be fine, but I guess frozen option is easier to get hold of. Defrost them before cooking – they defrost really fast. 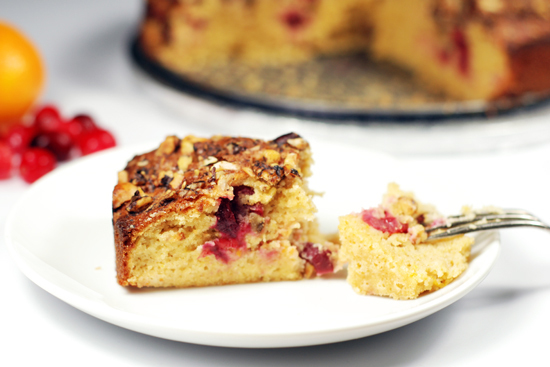 Chop them up roughly and add a tablespoon of sweetener to create a cake-ready cranberries mix. I think k your almond flour amount if off…maybe 2 cups instead??!!! Hi Bobby, apologies, this recipe is several years old now and I haven’t made it in a while, so I don’t remember precisely. The cake is quite thick, though, so 3 cups seem ok. Why do you think that’s too much? I will make it again soon and double check the quantities. It was stiff batter…I think the gram part is correct. Thanks for letting me know Bobbi. I will try to make this again in the next couple of days and will double check the quantities. Thank you! 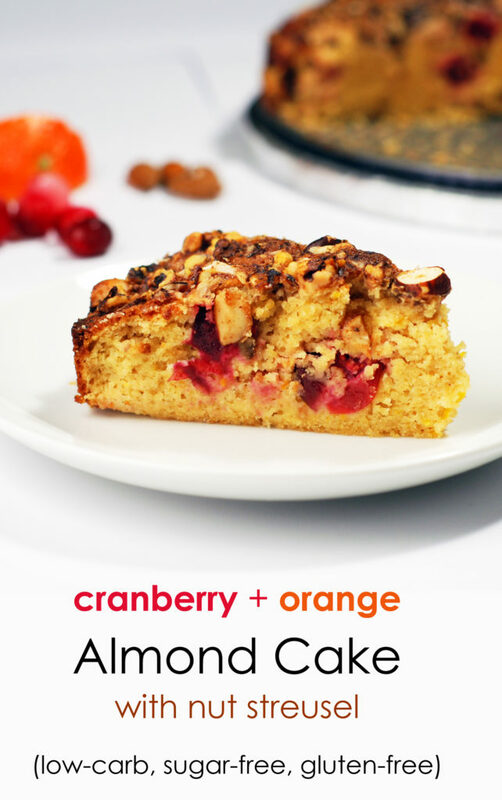 sounds like a yummy low carb cake!